It was a cloudy D-Day. Already Hermann Goering’s Luft­waffe had sur­ren­dered air suprem­acy over the Eng­lish Chan­nel, when on this date in 1944 in Nor­man­dy, France, the U.S. First Army under Gen. Omar Brad­ley assaulted Utah and Omaha beaches, while to the east Brit­ish and Cana­dian units of the Brit­ish Second Army under Gen. Ber­nard Law Mont­gomery fought their way ashore at Gold, Sword, and Juno. The landing by the Brit­ish Second Army was preceded by Brit­ish frog­men—the first Allied pre­sence on Nor­man­dy’s beaches. Their mis­sion: dis­mantle under­water mines and blow up obsta­cles through sev­eral lanes leading to the shore­line. Stretching 50 miles and defended by roughly 10,000 Ger­man sol­diers, the in­va­sion sec­tor was pro­tected by 600 Allied war­ships and 9,500 aircraft, which flew 14,674 sorties on D‑Day alone. With­in a week and a half, 278,000 troops and 15,000 vehicles were on Omaha Beach, the most heavily defended of the five invasion beaches. Not every­thing went according to plan. 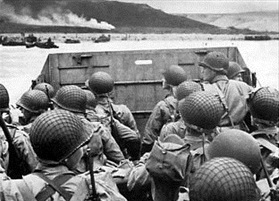 The Allies, for instance, were lucky that casual­ties (4,900 on D‑Day alone) were lighter than fore­cast. (German casual­ties on D‑Day are esti­mated at between 4,000 and 9,000.) Alas, for Hitler his night­mare scena­rio—a horri­fic war of attri­tion in the East that had com­menced with the Wehr­macht’s dis­aster at Stalin­grad (Septem­ber 1942 to Febru­ary 1943) and now the makings in the West of another dis­aster—was real­ized when the Wehr­macht could not dis­lodge Allied forces from their French beach­head. The unstop­pable libera­tion of West­ern Europe now began and with it the lethal end of Hitler’s Third Reich. 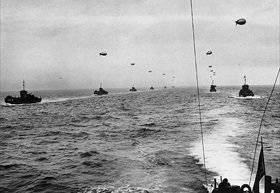 Left: Large landing craft convoy crosses the Eng­lish Chan­nel on June 6, 1944. The major­ity of troops who landed on the D‑Day beaches were from Great Brit­ain (112,824), the U.S. (52,889), and Cana­da (18,000). Close to 5,000 troops from other Allied coun­tries parti­ci­pated in the D‑Day landings and the en­suing Battle of Nor­man­dy (June 6 to August 30, 1944). They were drawn from Aus­tra­lia, Bel­gium, Czecho­slo­va­kia, France, Greece, the Netherlands, New Zealand, Norway, and Poland. Right: An American LCVP (Landing Craft, Vehicle, Per­son­nel) approaches Omaha Beach, Nor­man­dy, France, June 6. Smoke on the shore ema­nates from Ger­man posi­tions. The assault phase of Oper­a­tion Over­lord was known as Oper­a­tion Nep­tune. This oper­a­tion in­volved landing the troops on the beaches, as well as all other asso­ci­ated sup­porting oper­a­tions required to estab­lish a beach­head in France. 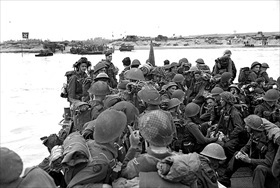 Operation Neptune began on D‑Day and ended on June 30, 1944. 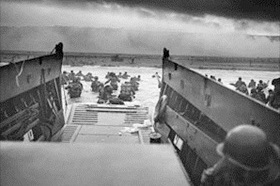 Left: “Into the Jaws of Death” is the descrip­tion of this photo taken of Com­pany E, 16th In­fan­try, U.S. 1st In­fan­try Divi­sion (the Big Red One) wading onto the Fox Green sec­tion of Omaha Beach at 8:30 on the morning of June 6. An earlier wave of B‑26 Mar­tin Marau­der twin-engine bombers had not even scratched the Ger­man defenses, much less created the promised in­stant fox­holes (bomb craters), on the 3.5‑mile stretch of long, exposed beach—the 13,000 bombs dropped missed their tar­get by 3 miles. The U.S. 1st and 29th Divi­sions together suf­fered around 2,000 casu­al­ties (two-thirds of Com­pany E were killed or wounded) as they ad­vanced up Omaha Beach into 4 bat­te­ries of artil­lery, 18 anti­tank guns, 6 mor­tar pits, 35 roc­ket launcher sites, 8 con­crete bun­kers, 35 pill­boxes, and 85 machine-gun nests. A high casu­al­ty rate of offi­cers left many low-ranking sol­diers leader­less and con­fused on the inva­sion beach. Some of these sol­diers were given field pro­mo­tions by pro­cess of elimi­na­tion. Ger­man for­ward units reported to head­quarters that the invasion had been halted at the water’s edge. Right: Members of an American landing party lend helping hands to others of their unit whose landing craft or DD (duplex drive) amphib­i­ous Sher­man tank was sunk by enemy shore guns, high seas, or mines. Thirty-two landing craft and most DD tanks were lost this way. 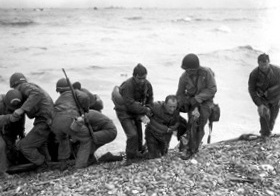 The survi­vors in this photo reached Omaha Beach by using a life raft. Most of the GIs who landed on Omaha and Utah beaches survived their encounter with death. 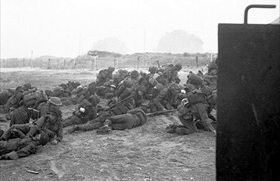 Left: British Second Army infantry wait to move off Queen White sec­tion, Sword Beach, while under enemy fire on the morning of June 6. By night­fall the Brit­ish had 28,850 men ashore and had seized the bridge over the River Orne, a principle objective that day. Right: Personnel of Royal Canadian Navy Beach Com­mando “W” land on Mike section, Juno Beach of the Normandy beachhead, June 6. Juno was the most exposed of the five inva­sion beaches, and the oppo­si­tion awaiting the Cana­dians was believed greater than that facing any other Allied force. By the time they had secured Juno Beach, one in six Canadians was dead or wounded. 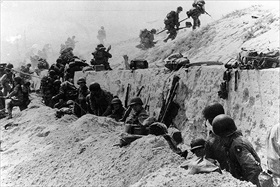 Left: Soldiers of the 8th Infantry Regiment, U.S. 4th Infan­try Divi­sion, move out over the sea­wall on Utah Beach after coming ashore in front of a con­crete wall near La Madeleine, France, on June 6. 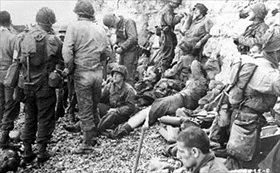 Right: In a photo taken June 8 on Omaha Beach assault troops of the 3rd Bat­talion, 16th In­fan­try Regi­ment, U.S. 1st In­fan­try Divi­sion, having gained the com­para­tive safety offered by the chalk cliff at their backs, take a breather before pushing inland. 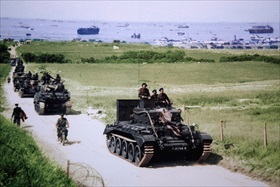 Left: A Cromwell tank leads a British Army column from the 4th County of Lon­don Yeo­manry, 7th Armoured Divi­sion, after landing on Gold Beach on D‑Day in Ver-sur-Mer, France. 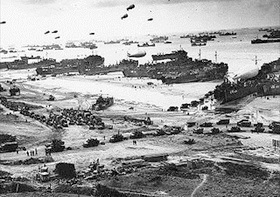 Right: Landing ships of all styles put cargo ashore at Omaha Beach at low tide during the first stages of the operation, June 1944. Indeed, toward evening on D‑Day, even the Omaha beach­head bustled with acti­vity, having been reported safe for wheeled and tracked vehicles. Kitchens were set up and ser­ved the survivors beans and wieners and hash browns.